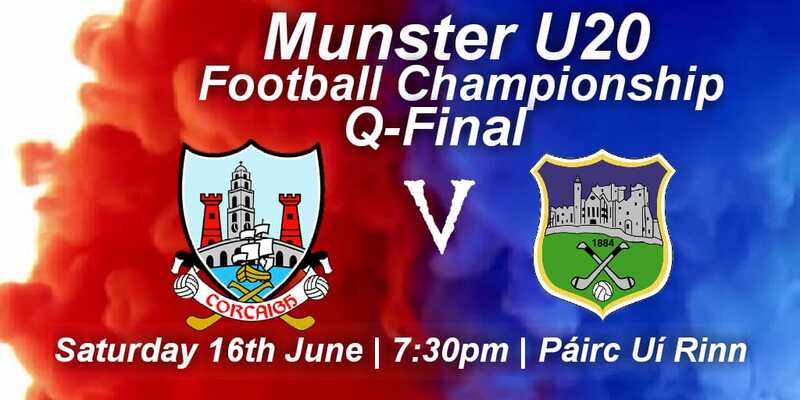 The Cork U20 Footballers begin their championship campaign next Saturday 16th June when they take on Tipperary. This year is the first year of the new U20 championship, which replaces the U21 championship, which had been running since 1962, with Cork winning a total of 26 times. The cup presented to the U21 Football winners was known as the Corn na Cásca and was first presented by the Munster Council in 1966 to commemorate the jubilee of the 1916 Rising. Phase 2: If teams are still level, an additional two periods of five minutes each way will be played. There shall be a maximum time space of five minutes between the end of the first phase of Extra Time and the beginning of the second phase. The Half Time interval in the second phase of Extra time should not exceed five minutes. The 5 players above must be chosen from players who have participated in the game, either in normal time or in Extra Time. Players who receive a red card in Hurling or Football, and players who receive a black card in Football, in normal time or Extra Time are not permitted to participate in the free-taking competition. The Referee will decide which end the free taking competition should be played into. He will toss a coin in the presence of the two captains to see which team will have the option of going 1st. The Referee will ensure two goal umpires are in place at the end in which the competition is being played into. Frees will be taken by each of the five players from a position of their choosing on the 65m line (Hurling) or from approximately the centre of the line marking the semi-circle (33m) in Football. Frees in football may be taken from the hands or off the ground. Rules of Set Play Riail 2.5 (a) and (b) and Rules of Foul Play 4.24, 4.25 and 4.27.Breaches of these provisions will render frees null and void and they cannot be retaken. In football, frees shall be taken in accordance with the provisions of T.O 2017 Cuid II Rules of Set Play - Rule 2.5 and Rules of Foul Play 4.23, 4.24 and 4.26. Breaches of these provisions will render frees null and void and they cannot be retaken. All other players, managers, officials, backroom personnel etc should be at their designated sideline area, and off the field of play when the free-taking competition is taking place. The game is awarded to whichever team scores more of their 5 frees. If still level then sudden death frees to be taken using the same 5 players in order(i.e. first sudden death free is taken by the player who took the first free for each side, 2nd sudden death free if required to be taken by the player who took the 2nd free and so on). If a player scores in sudden death and his direct opponent misses, the game is awarded to the team of the player who has scored. There will be updates of both games on Cork's 96FM, Red FM, Cork GAA website and Twitter page, but nothing beats being there!! Student/OAP receive €5 concession on full priced adult tickets with valid id prior to entry at the designated stile. Tickets available to buy in advance in participating Centra and Supervalu outlets.